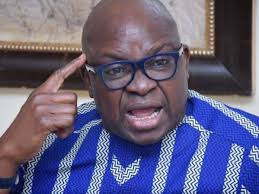 Fayose: "Those Who Voted Buhari In 2015 Should Ask For Forgiveness"
Governor Ayo Fayose of Ekiti state has asked those who voted for President Muhammadu Buhari in the 2015 general election to beg God for forgiveness. According to him, the reason is because Buhari has brought untold economic hardship and unprecedented level of insecurity upon Nigerians. Fayose said things would have been different if Buhari did not win. He appealed to Nigerians to vote out the All Progressives Congress (APC), saying the hardship that will befall the country if Buhari is re-elected is better imagined than experienced.